Hello friends! 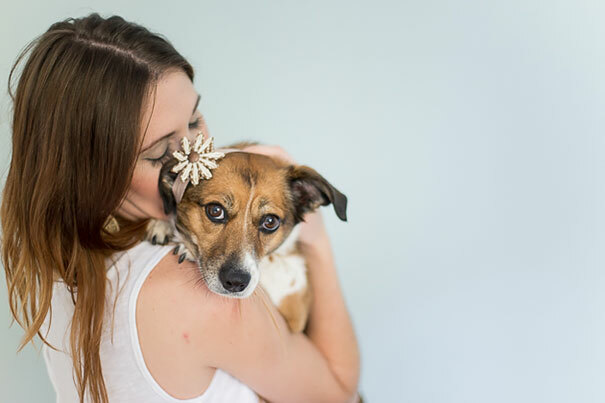 With Mother’s Day being THIS SUNDAY, May 8th, you might be wondering what to get for that dog mom in your life— you know, the *special* one. The one who can’t leave her dog’s side, who is always wondering what he is thinking, feeling, wanting. The one who wishes Text From Dog could be a real thing so she could get hourly updates from her baby. The helicopter mom! This nifty harness works for walks and car rides alike- the nylon strap allows a seatbelt to be looped through for secure restraint while in the car. 2. DIY Dog Bouquet That You Made Yourself! A beautiful representation of her love in flower form, the fact that you made it yourself makes it that much more special! This durable, stylish canvas bag is perfectly toting her fur baby about town. We all know she’s cooking home-made dog meals and will be proud to tell the world. A cozy and warm bed for the sunshine of her life. Another higher budget item, but for those winter months when long walks are ruf on dog’s paws and exercise is needed? See everything he’s doing, whether in the next room or in the next town. She’ll wear it with pride and you know it! Because grooming is as motherly as motherly gets. Verameat crafts delicate, beautiful jewelry with a bit of bite. Perfect the edgy dog mom in your life. Not that she has a problem sharing out of her water bottle, but this collapsable bowl fits easily in any carrier, human or canine. We know, pup. We know. 15. Voyce, starting at $299. The ultimate “what is my dog feeling?” answering tool, Voyce is a wearable collar that helps monitor your pup’s health and wellness. Once the pups are in bed, she needs to drink out of something while hovering! Travel in comfy and safe style. Dog tag? $15.95. Peace of mind? Priceless. Safety first, even during beach play. Because a dog mom always knows who to trust. The perfect present for helicopter moms, Camio is an app that turns your laptop, cell phone and/or tablet into a streaming video camera. It’s free with one camera device and $9 for the plus plan with two devices! Now you can see what your pup’s up to when you’re away. Lets just embrace this title already. Because who doesn’t want to be a crazy dog lady? Am I right?